Introducing Nature’s Greeting Card, the fantastic new greeting card that quickly grows to reveal your secret living message; ultimately a truly amazing greeting card. Simply follow the planting instructions, add some water, and then watch the greeting bean grow and grow. Within days, your secret living message is revealed, The Amazing Magic Plant is a unique living greeting card perfect for special people and occasions. 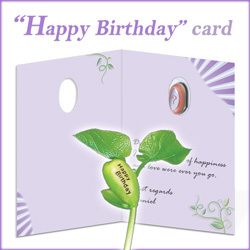 Buy the greeting card for birthdays, Valentine’s Day, Mother’s Day, or any occasion when you give a greeting card. 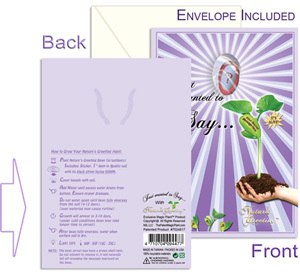 Each card includes a greeting card, envelope, Nature’s Greeting Bean, as well as detailed growing instructions. Incidentally, the card has a 3-year shelf life, so you can buy them way before the special event. Instead of cluttering a drawer with traditional greeting cards, Nature’s Greeting Card grows to remind the receiver daily of how special they are to you. “I Love You” will be engraved on the beautiful plant’s central Bean. Tell someone “I love you” with Nature’s Greeting Card. However, it’s more than a card. The recipient plants the seed then waters it and waits for it to grow. 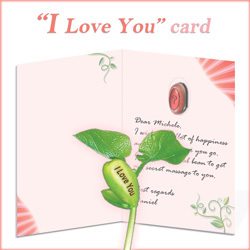 Finally, the grown plant grows bears the message, “I Love You.” What a great way to tell someone you love them day after day! Send best wishes through nature! “Best Wishes” will be engraved on the beautiful plant’s central Bean. The recipient of Nature’s Greeting Card simply plants the seed then waters it. Then they wait for it to grow. The special message becomes visible once the plant grows. Send your loved one kisses and hugs with Nature’s Greeting Card. First and foremost, give a plant that grows to remind your loved ones of your hugs and kisses! “XOXO” will be engraved on the beautiful plant’s central Bean. Order the Nature’s Greeting XOXO Card. Do you want to say “Happy Birthday” in a unique, lasting way? Of course, Nature’s Greeting Cards provides a way. Send the special greeting card to the birthday girl or guy. The card includes instructions. Congratulate your friends in a memorable way. Give the card and bean with a special message for a milestone or accomplishment. First, plant the seed, then water it. Finally, watch it grow. “Congratulations” will be engraved on the beautiful plant’s central Bean. The best way to cement your friendship! “Friends Forever” will be engraved on the plant’s central Bean. No doubt your friends will love it! Express your appreciation with a “Thank You” plant! “Thank You” will be engraved on the beautiful plant’s central Bean. 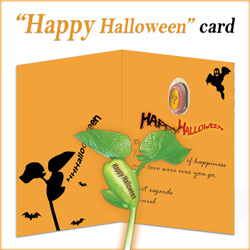 Tell your friends, “Happy Halloween” with this unique gift card. Magic Plant gift cards include instructions for growing the plant. First, plant the seed, then water it and wait for it to grow. Once the plant has sprouted and broken through the ground, “Happy Halloween” will be engraved on the beautiful plant’s central Bean. Spread holiday cheer with gift cards bearing a special message. Send your friends a unique holiday greeting. 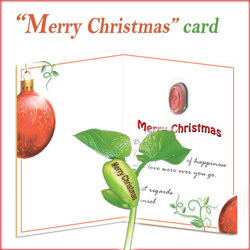 “Merry Christmas” will be engraved on the beautiful plant’s central Bean. Tell friends “Happy Holidays” with unique gift cards. The holiday greeting is engraved on the plant’s bean. First, present the card to your friends. Secondly, they plant and water the bean. Finally, they wait for it to grow. Afterward, they will see the words, “Happy Holidays” engraved on the beautiful plant’s central Bean.